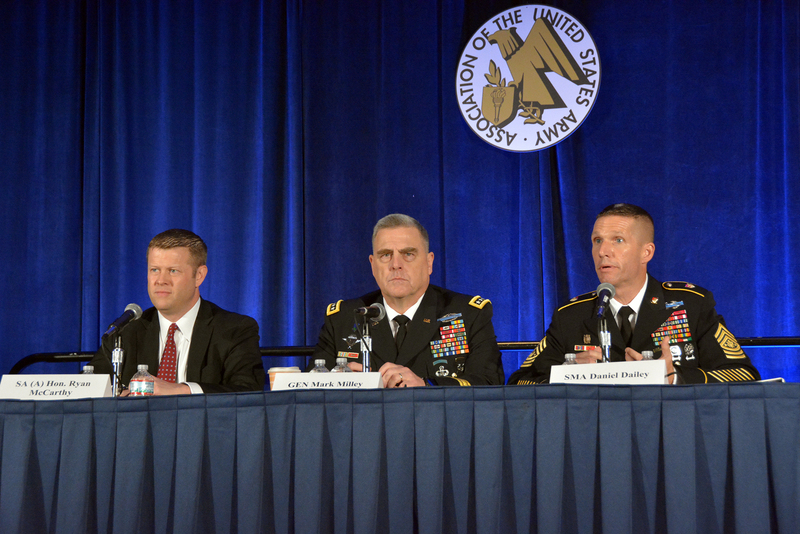 The Army’s top leaders reaffirmed their deep commitment to the well-being of soldiers and their families, and answered questions on a variety of topics during a packed Association of the U.S. Army Annual Meeting and Exhibition town hall concerning Army families. Chief among the messages delivered by Army Chief of Staff Gen. Mark A. Milley was his ironclad assertion that Army readiness cannot happen if soldiers’ families are not taken care of. “Priority one is combat readiness of the force. Second is combat readiness of the future force, otherwise known as modernization; but the third is not really a third priority, it is a constant priority and that is to take care of soldiers and families,” said Milley, reiterating his oft-stated belief that soldiers cannot focus on combat tasks unless they know their families – especially their children – are taken care of. Sgt. Maj. of the Army Daniel A. Dailey described his interaction with families across the Army, and shared his impressions of how family members are feeling based on feedback he’s received at multiple town hall meetings. “They have hope in our leaders, they believe in us and they trust us, but we have to keep trust, because a break of that bond would cause significant degradation in the morale of our families and our soldiers. I think that to this day we have maintained that trust as an institution, but there are things we can get better at,” Dailey said. Childcare, a top priority, can improve with better background screening of employees, hours that match families’ work schedules, and maintenance of infrastructure, Dailey said, recognizing that in the current fiscal environment, tough choices have to be made. He affirmed that families understand the need to invest in combat gear over sustaining certain family programs, saying “we’re OK, we’re not broken, we’re not bent, we’re OK,” he said, acknowledging “there are things we can improve” by continuing to listen to families. A question about suicide prevention arose first and was addressed by Dailey with the declaration that after years of studying the problem, the Army has made strides in breaking the stigma of mental health issues with initiatives such as screening during in-processing and out-processing soldiers, and a focus on peer intervention. “In many cases, when we have a suicide across the force, someone else saw the indications but failed to do something about it,” he said. Milley added that “young people are doing diving catches every day” to prevent their peers from killing themselves at the tipping point, and offered his studied view of the problems people deal with daily. “The first thing to think of is, there but for the grace of God go I. “The human psyche is very fragile and any one of us, any human under the right combination of stress can break, so the stigma piece is really important. There should be no stigma to any sort of mental health. People struggle every day,” Milley said in a fatherly tone, putting forth that while it may sound simple, sleep, exercise and good eating habits, along with taking advantage of resources that build resilience, can go a long way toward overall mental health. Other topics discussed at the town hall were education, medical care and problems with making claims for items broken or mishandled during permanent change of station moves. Milley shared a personal story of the time his wife had to handle the family’s move to Korea on her own, describing having been “in the doghouse for a year” with her because it was such a logistical nightmare. He vowed to personally look into making the “painful process of filing claims” easier. Acting Army Secretary Ryan McCarthy’s contribution to the town hall was simple: He vowed to fight hard to improve funding. He said, “I’ve been on the job a short period of time, and my singular focus has been how do we build a budget that has the resources and authorities that we need to support the force. Times are very difficult, a lot of this is out of our control. To get sustainable, sufficient, predictable funding has been a challenge.